* Please note that these two items listed above will not be released at Dolpa 38. * Please note that these two items will be available only at Dolpa 38. Place a pre-order before Dolpa 38 → pick up your order at Dolpa 38! Please place a pre-order via VOLKS Website Store. * Only VOLKS VS/VIP members can place pre-orders. We will email you when your credit card payment is settled. Please pick up your order at “New Dollfie® Pick-up Counter”. ●Only VOLKS VS/VIP members can place pre-orders. ●Pre-orders can be accepted only via VOLKS Website Store. Please register as a user before placing an order. ●Each item / Limit one per person. ●If we receive too many pre-orders, there is a possibility that we will have a lottery. ●Once you place your order, you cannot cancel it. ●Full advance payment through credit card is required. ●You need to pick up your order at Dolpa 38 on December 17th (Sun). 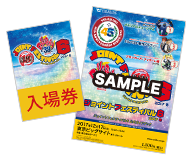 * Please note that “Joint Festival 6 Admission Ticket” is necessary to join Dolpa 38. * You cannot have it delivered to your home or pick it up at a VOLKS Store. Once you pick up your order at Dolpa 38 event site, you can send items via “Parcel delivery service” there. ●When picking up your order at Dolpa 38, please show us “VOLKS Point Card” and “one photo-identification or two identifications without photos”. Please note no one can pick up your order on behalf of you. * They are not available through VOLKS Mail Order (telephone order) System. ●On the first day: January 20th (Sat), 2018, each store has different guideline. Please check each store’s guideline and come to the designated place at the designated time. Some stores hold lotteries. Based on the lottery numbers you draw, we will ask you to form a queue again and enter the store in order when the store opens. Some stores will serve on a first-come, first-served basis. ●Before visiting us, please check the “business days” and “opening hours” of the store of your interest. ●Sales procedure via the website is partially different. Please visit the special site in VOLKS Website Store for the details. ●As these items will be available with limited stocks, they might be sold out. Your kind understanding is appreciated. Joint Festival 6 Admission Ticket & Official Guide Book are Necessary! Please come to “Boys’ Dormitory” Special Booth. Show us Joint Festival 6 Official Guide Book and get a numbered ticket. We ask the winners to make a payment at Tenshi-no Sumika Shop. The winners can pick it up at “New Dollfie® Pick-up Counter”.